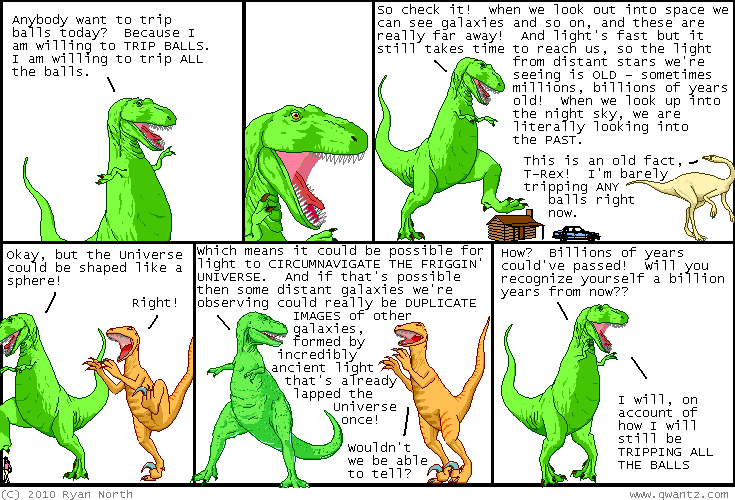 Dinosaur Comics - May 10th, 2010 - awesome fun times! –Holy crap he was so handsome! And smart too, actually!! May 10th, 2010: TCAF was awesome! It's great to have a local Toronto show that's so extremely excellent. I met tons of awesome readers who, it turns out, are all the nicest people! To that I can only say: good work, everyone. One year ago today: TRUE FACTS: there was a duke3d ladder, and i was really good - in the worldwide top 50! i thought i was really somethin' else until i saw a video of the top two players in a match, and it was clear to me i would never get to that level.